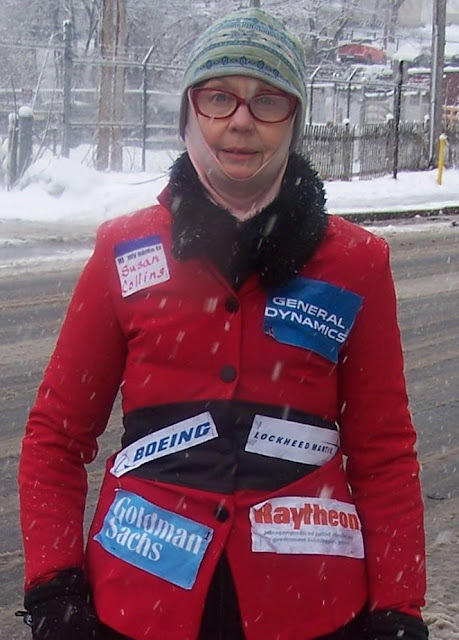 If Senator Susan Collins had to wear her corporate sponsorships for Maine voters to see, this is what it would look like. Here are videos made at a talk by investigative reporter Alex Nunes speaking at the University of Southern Maine in Portland June 2, 2018. This version is the whole talk including Alex's response to questions from the audience. This version has been edited to feature just Alex's remarks about how so-called defense contracting at Bath Iron Works, a subsidiary of General Dynamics, has infested Maine government. This is a problem at the national, state and municipal leve. His focus is on Congress and especially the odious Senator Susan Collins, whose husband profits mightily every time she votes for more Pentagon contractor enrichment. Thanks to Martha Spiess of Peace Action Maine for both videos.